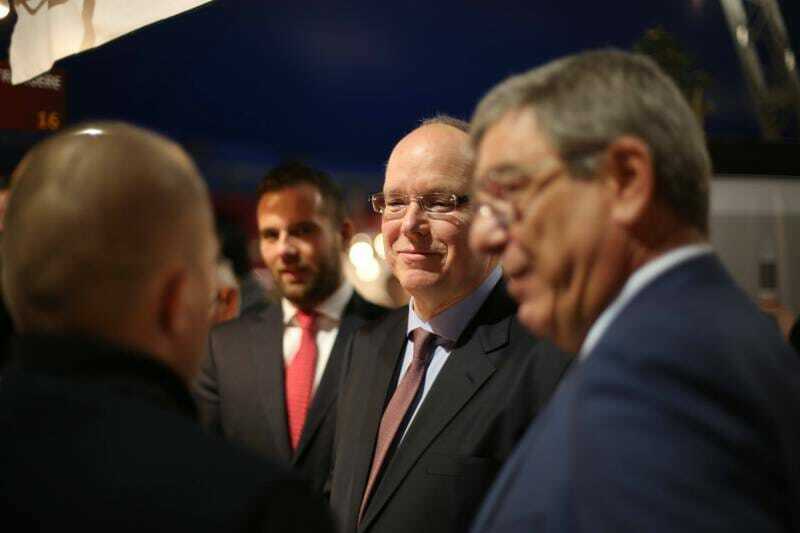 Prince Albert II visited the 23rd Salon de la Gastronomie and greeted all the exhibitors. More than 100 producers of gourmet French, Italian and European products presented their products in a refined and friendly setting last weekend under the Fontvieille Marquee. Wines, champagnes, cognac, as well as salmon, foie gras, seafood, truffles, caviar, chocolate, cheeses, cured meats, organic products, jams and more filled the space with a festive and delicious atmosphere. Exhibitions created by the Association of Historic Grimaldi Sites were also on display, on stands 93-95, to promote the many cultural places in France and Italy that have a shared history with the Family Grimaldi. 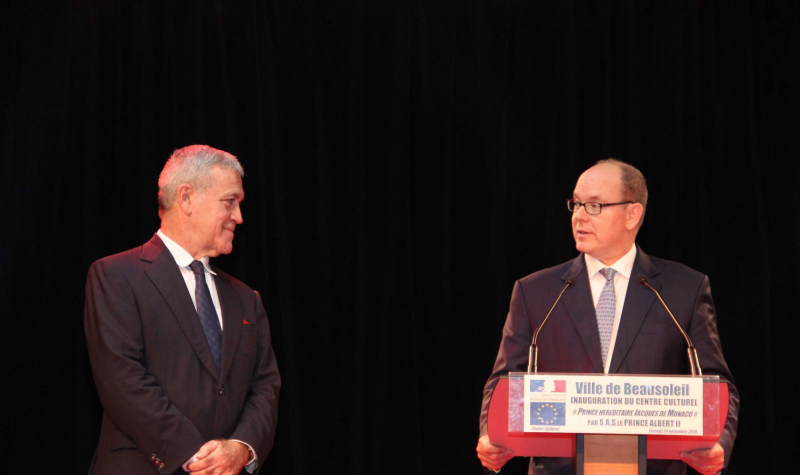 HSH Prince Albert II of Monaco is the Association’s President of Honour. 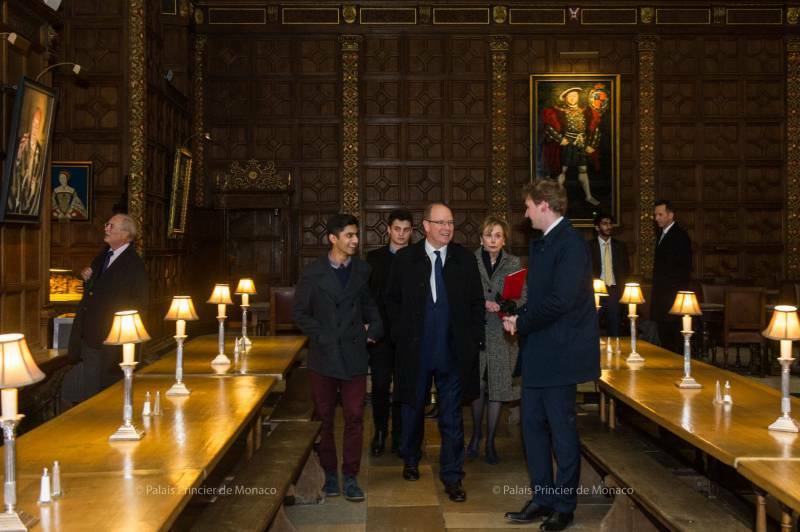 Prince Albert II visited the Cambridge Union Society on Friday 23 November. Created in 1815, the society promotes debate and free expression and is the largest corporation of Cambridge University. 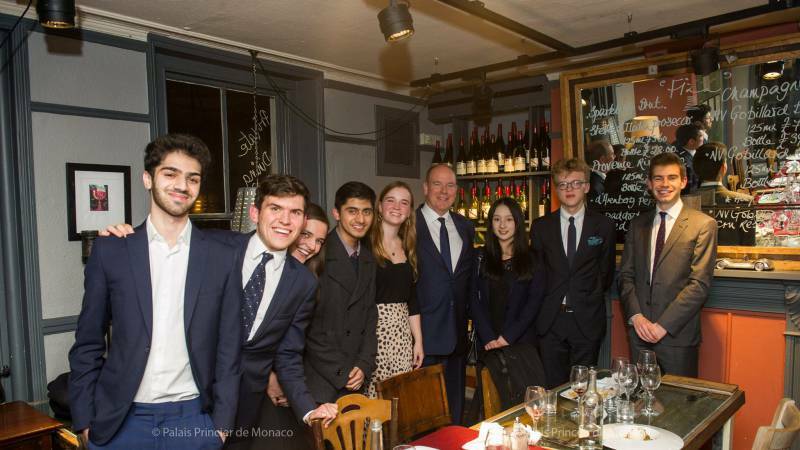 HSH the Prince met with HE Evelyne Genta, Ambassador of the Principality of Monaco in London, HE Bernard Fautrier, Vice-President and Managing Director of the Prince Albert II Foundation, and students from Trinity University and St. John’s. 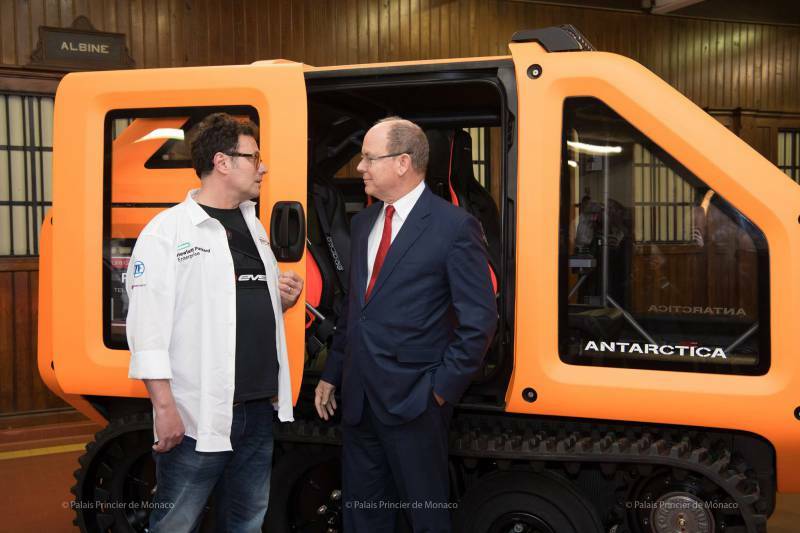 In his speech, Prince Albert recalled, among other things, the work his foundation does for the protection of the oceans. 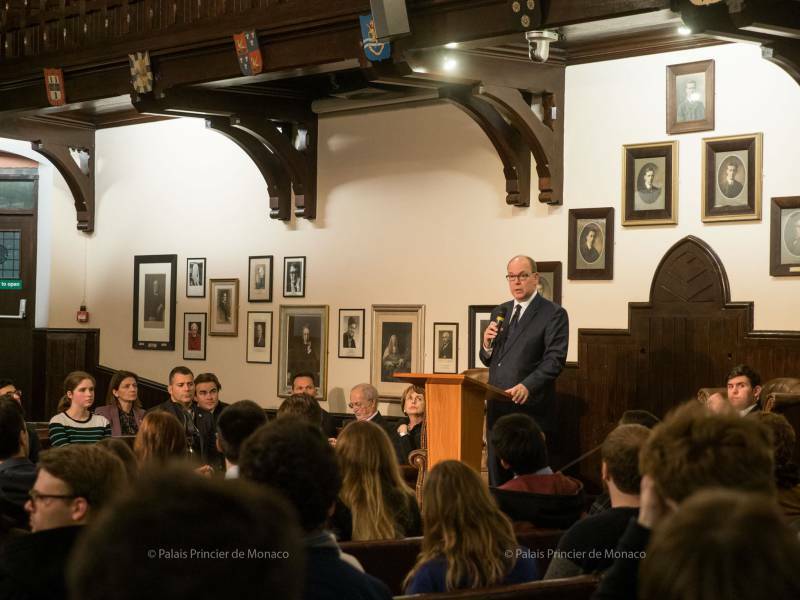 After his address, the Prince answered the students’ various questions in the presence of Charles Connor, President of the Cambridge Union Society. At the end of the debate, the Prince, accompanied by all the students, headed to the 1815 Union Bar. The famous pub once hosted scientist Stephen Hawkins and actors like Mark Hamill and Emma Thompson. 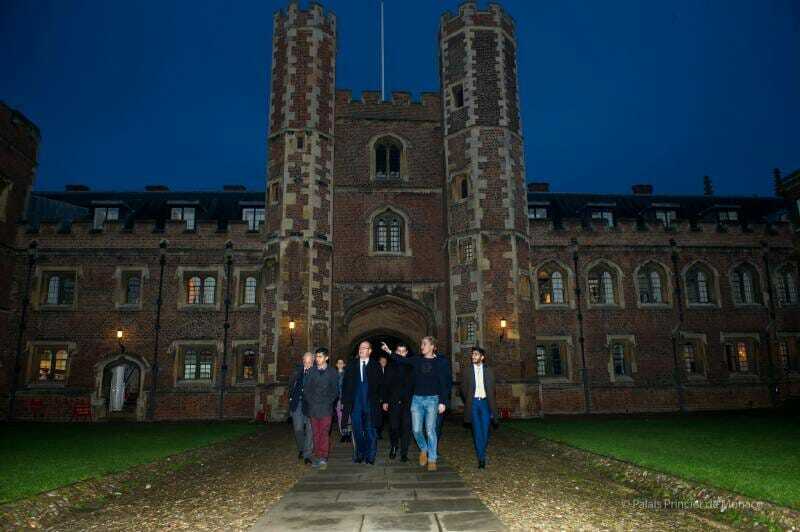 The visit ended with a dinner with members of the Cambridge Union Society Committee. 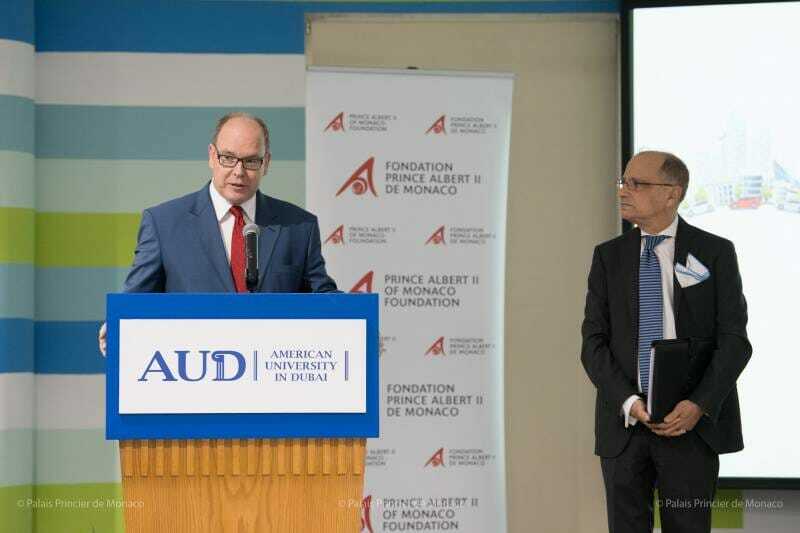 In Dubai, Prince Albert II and Monaco Inter Expo unveiled the plans for the Expo 2020 Monegasque Pavilion during a gala dinner, which also benefitted the Prince Albert II Foundation. The title of Expo 2020 Dubai is “Connecting Minds, Creating the Future” and will have three themes: opportunity, mobility and sustainability. Ever since the first Expo back in 1873 in Vienna, the Principality has never missed a universal exposition. Prince Albert-1 presented the results of his oceanographical research during two Expos held in Paris in 1889 and 1900. 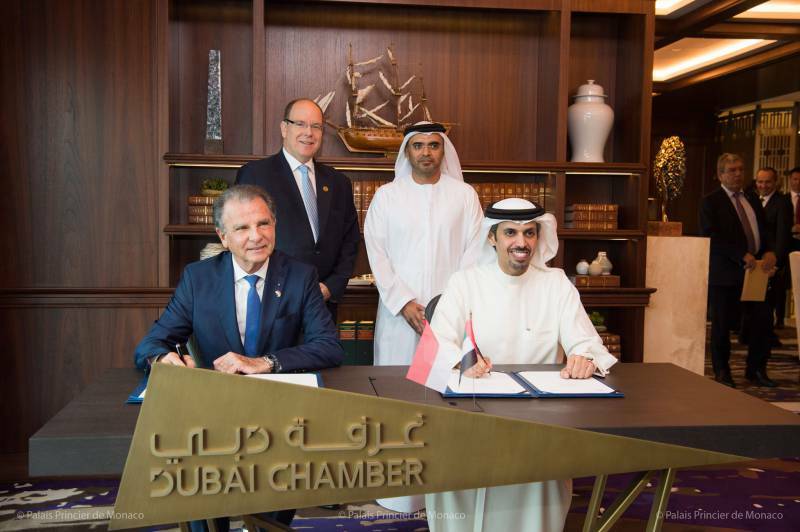 The World Expo will be held for the first time in Dubai in 2020 on a site that is twice the size of the Principality. To date, 190 countries, including Monaco, will participate in the event. 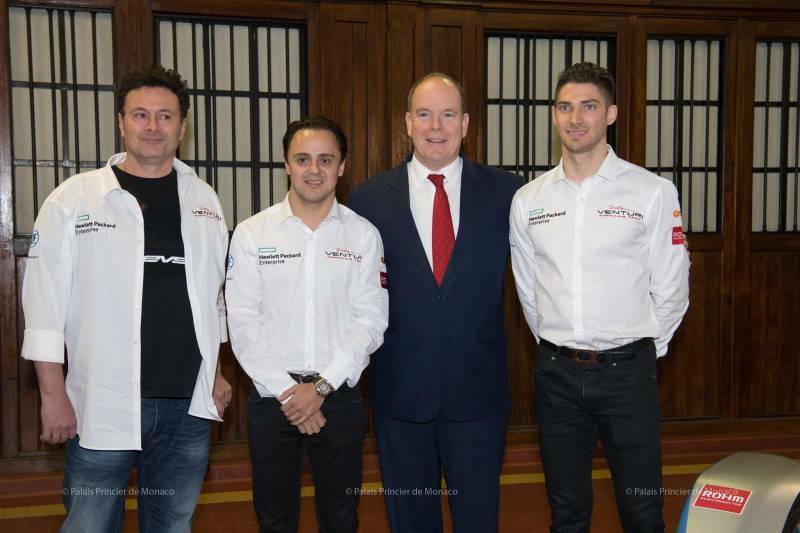 HSH Prince Albert II received a delegation from Monaco’s Venturi Automobiles and the Venturi Formula E Team on Friday 30 November. 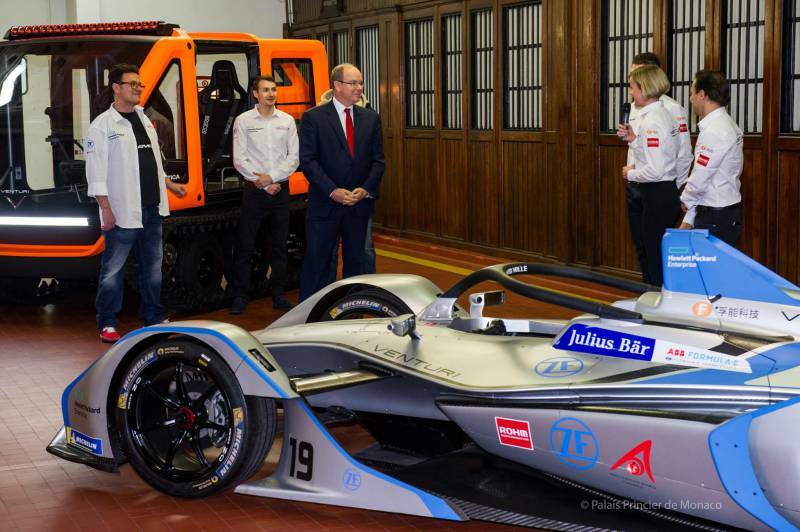 An official presentation was held for the Venturi Antarctica (the first electric vehicle for polar exploration) and the new Formula E season 5 (which will begin in Diriyah, Saudi Arabia, on 15 December). 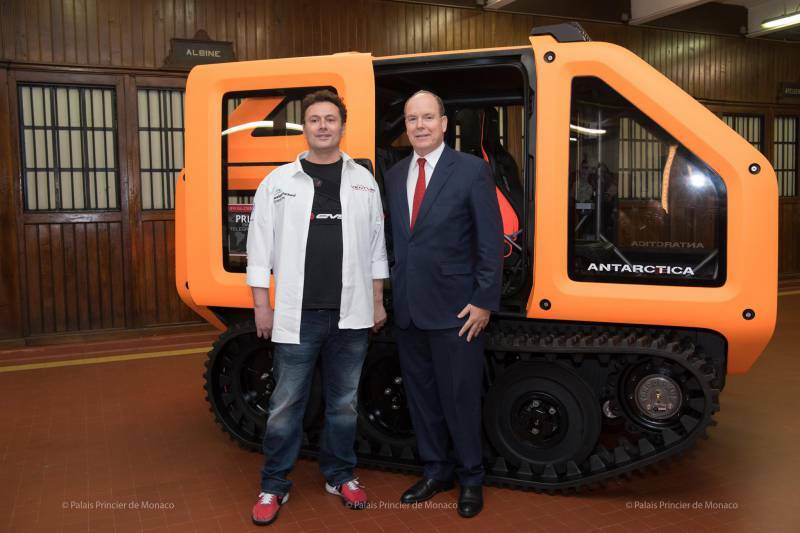 Venturi Automobiles, a pioneering Monegasque company in the field of electro-mobility, built the Venturi Antarctica to provide scientists with an environmentally friendly vehicle which can operate in extremely cold conditions. 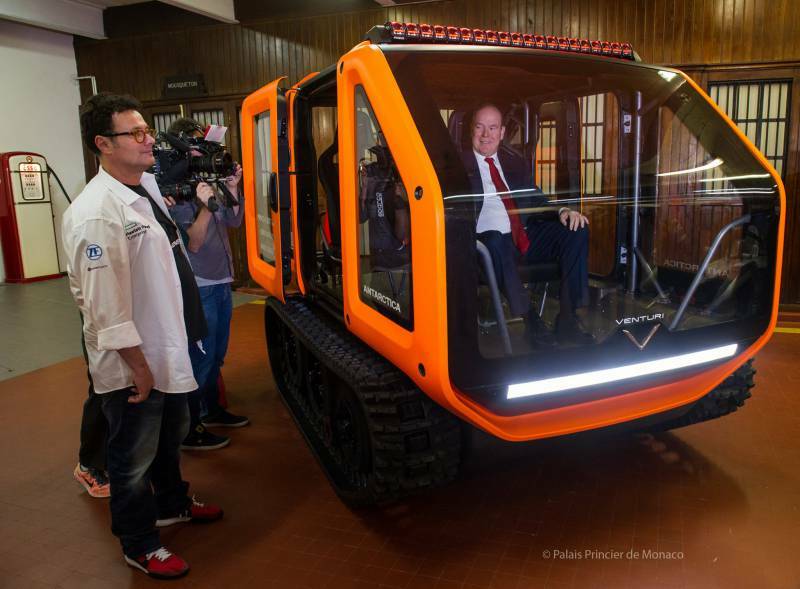 With zero emissions, it is able to drive on hostile terrain and withstand temperatures of -50°C. It can carry three people as well as luggage and equipment for around 45 kilometres at a speed of 20km/h. 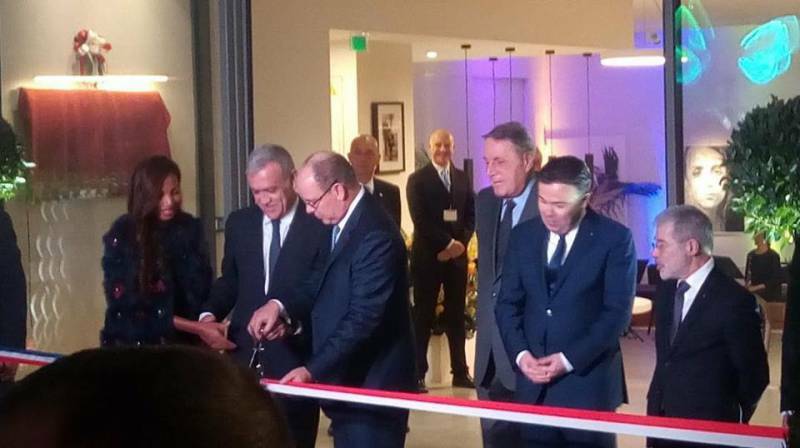 On Saturday, the mayor of Beausoleil, Gerard Spinelli, invited the Sovereign to officially inaugurate the new Hereditary Prince Jacques de Monaco Cultural Centre. The people of Beausoleil amassed on both sides of the asphalt to welcome Prince Albert II for the inauguration. The Prince cut the ribbon, which was in the colours of the Principality and France, before unveiling the plaque for the new centre. At 6/8 Avenue General de Gaulle, the building is in the heart of the city, is nearly 2000 m2, cost 6.8 million euros and is spacious, bright and promises to help enrich the public through culture. At the new auditorium within the Centre, Prince Albert said that Beausoleil now has a beautiful space to express the cultural mosaic of our time. Dance, music, literature, art, exhibitions, a toy library for children complete with video games and multimedia workshops will all be available to the public. 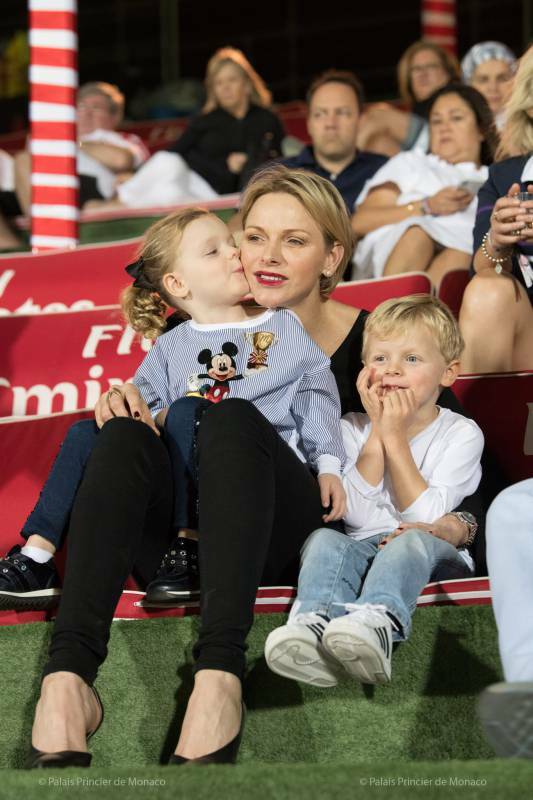 HSH Princess Charlene attended the 49th Dubai Rugby Sevens event at Dubai’s Sevens Stadium from 30 November to 1 December 2018. Founded in 1970, the event is the longest running sports event in the Middle East. Princess Charlene was accompanied by her princely children for the occasion, Hereditary Prince Jacques and Princess Gabriella, who came to support the IMPIS team (which means warrior in Zulu), who participated at the International Open for the second year in a row. The team was created under the leadership of Gareth Wittstock, Princess Charlene’s brother, and is composed of 7 players from Monaco’s national team and 5 international players (including the captain of Portugal’s 7-a-side rugby team). 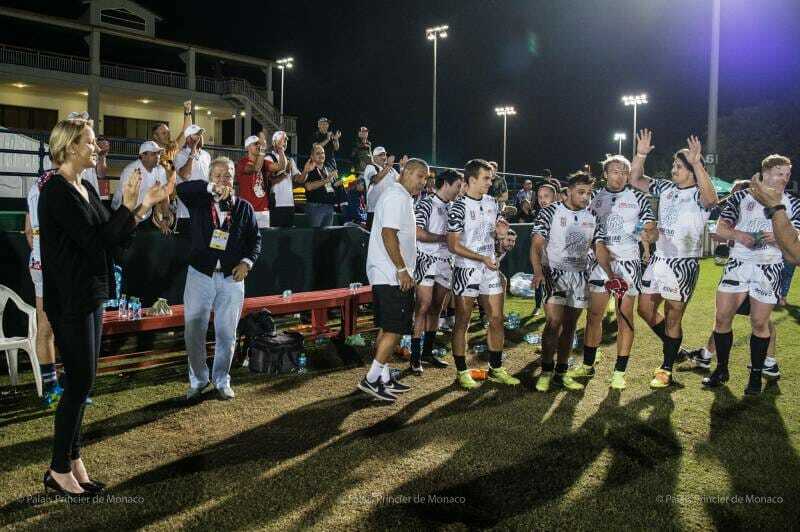 Despite a faultless journey through the tournament, the team’s great adventure stopped at the gates of the finals, but the experience allowed the young Monegasque players to prepare for the next European Championship. Last weekend, Princess Charlene also cheered on Monaco’s Formula 1 driver Charles Leclerc during the Abu Dhabi Grand Prix.